A transgender person from Belize, who was on the way to a regional conference being held in this country, has claimed discrimination by immigration officers at the Piarco International Airport. Mia Quetzal, a Belizean and regional coordinator of the Caribbean Regional Tran in Action was invited to attend an United Nations Development Programme (UNDP) meeting held in this country 12-13 April. Quetzal arrived at Piarco International Airport around 4 p.m. on COPA Airlines 411 11 April. Quetzal was wearing female garments at the time. When Quetzal's passport was checked, immigration officers questioned why she was listed as a male. "I am indeed male," Quetzal told the immigration officer. Quetzal was told to "go stand in a corner" for more than an hour and a half before she was able to leave the airport. The issue of the alleged discrimination meted out to Quetzal was aired on the Belize national television 7 News on 13 April. "Recently, we've seen a lot of regional news about friction between Jamaica and Barbados. It's because Jamaican females claim they are being sexually harassed and accused of illicit activity by Barbadian Immigration authorities," the 7 News coverage stated. "It's become a big deal, because as Caricom member states, Jamaicans should move freely into Barbados or any other Caricom country. And that's how it should be for Belizeans as well. 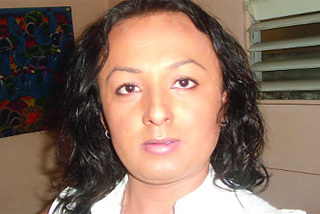 But now, one Belizean gay activist group claims that a Belizean transgender person was sexually discriminated against at Piarco International Airport in Trinidad," the news programme stated. Caleb Orozco, the executive president of the United Belize Advocacy Movement, has described the incident as "deliberate humiliation". "This person had her documents together. She changed her picture to present how she looks in person, she had the correct name. Yet she was treated like a dog," Orozco stated in a letter yesterday. "For us to simply allow another Belizean to be humiliated in another Caricom country is not only a disgrace but an insult to our national sovereignty," Orozco stated. Colin Robinson, the spokesman for the Coalition Advocating for the Inclusion of Sexual Orientation (CAISO) of Trinidad and Tobago, described the incident as an "embarrassment to the country". "It's an embarrassment to the country. Clearly unprofessional no need to shame and embarrass people for who they are," Robinson said in a telephone interview yesterday. "My hope is that it will spur the Ministry of National Security to improve sensitivity to other Caricom nationals. Our hope is it is an opportunity for education for sexual and gender diversity and that the immigration officials appropriate training to deal with the issue," he said. "The Prime Minister (Kamla Persad-Bissessar) needs to figure out if we want to be a first class nation or an international embarrassment," Robinson said. Calls to Chief Immigration Officer Andy Edwards for a comment on the issue proved futile up to presstime.